President Muhammadu Buhari yesterday met with the Service Chiefs for about two and half hours behind closed doors. Briefing newsmen after the meeting, Minister of Defence, Gen. Mansur Dan-Ali (rtd) said they came to brief the President on their activities while he was away on a 10-working day leave in London, United Kingdom. According to the minister, the Service Chiefs intimated the President on the worrisome security development in the Boko Haram ravaged North-East region while he was away. Asked what major decision had been taken, he said “The decision that has been taken is that we have seen that there is a lot of improvement in the security situation in the country more especially in Zamfara and Benue state and in the Niger Delta. 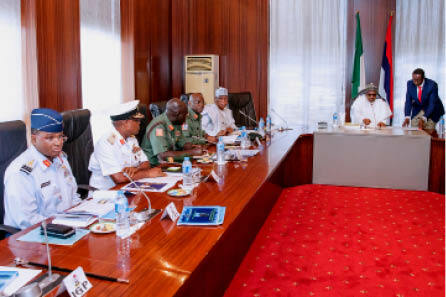 The Chief of Defence Staff (CDS), Gen. Gabriel Olonisakin, who equally briefed newsmen on the meeting said “We just had two and half hours meeting with the president and commander in Chief, we reviewed the security situation across the country in all the geopolitical zones and of course we made all our comments, especially the new operations in Benue, Zamfara, Taraba operation WISE stroke, and operation (Saradaji). “We gave the extent of successes in these operation and we are to continue in this line of action in these operations. Those in attendance were Babagana Monguno, National Security Adviser; Chief of Defence Staff, Gen. Gabriel Olonisakin; Chief of Army Staff, Lt. Gen. Tukur Buratai; Chief of Naval Staff, Vice Admiral Ibok Ekwe Ibas; and Chief of Air Staff, Air Marshall Abubakar Sadique. Others were Ahmed Abubakar, Director-General of the National Intelligence Agency (NIA), Ibrahim Idris, Inspector General of Police and the Acting Director General of Department for State Services, Matthew Seiyefa.